A pair of US warplanes intercepted two Russia jets over a part of Syria they were not supposed to be operating in, the Pentagon said Thursday. At one point during Wednesday’s incident, the American F-22 Raptor stealth fighters deployed chaff and flares to convince the Russian Su-25s to leave the area, and one US pilot had to “aggressively maneuver” to avoid a midair collision, Pentagon spokesman Eric Pahon said. The Russian fighters had flown into airspace controlled by the US-led coalition that is fighting the Islamic State group in Syria, crossing onto the east side of the Euphrates River near Albu Kamal. They “were promptly intercepted by two F-22A Raptors providing air cover for partner ground forces conducting operations to defeat ISIS,” Pahon said. “The F-22s conducted multiple maneuvers to persuade the Su-25s to depart our deconflicted airspace, including the release of chaff and flares in close proximity to the Russian aircraft and placing multiple calls on the emergency channel to convey to the Russian pilots that they needed to depart the area,” he added. The incident lasted approximately 40 minutes before the Russian aircraft flew to the west side of the river. During and following the encounter, coalition leaders contacted Russian officers on a special hotline to try to calm the situation and avert a “strategic miscalculation,” Pahon said. The Pentagon said that in early November the US verbally agreed with Moscow that the Russians would keep west of the Euphrates and the coalition would stay east. 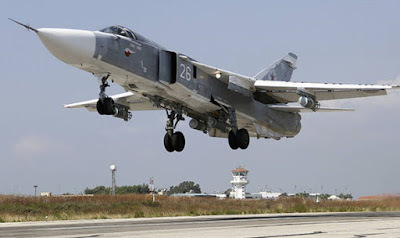 “Since agreeing to this deconfliction arrangement, the Russians have flown into our airspace on the east side of the river six to eight times per day, or approximately 10 percent of the Russian and Syrian flights,” Pahon said. “It’s become increasingly tough for our pilots to discern whether Russian pilots’ actions are deliberate or if these are just honest mistakes,” Pahon said. Albu Kamal was IS’s last urban stronghold in Syria until the army retook it last month.